Can you believe it's already April?!! Time is flying by, and I realized I haven't shown you my samples for the Ranger Booth from Creativation this year. In the coming weeks, I will post all the samples with a few step outs....better late than never...plus, I really need to get back to blogging regularly again. Today, I have an all occasion or celebratory card using Tim Holtz Alcohol Ink, which was a favorite of mine. Thanks for stopping by! 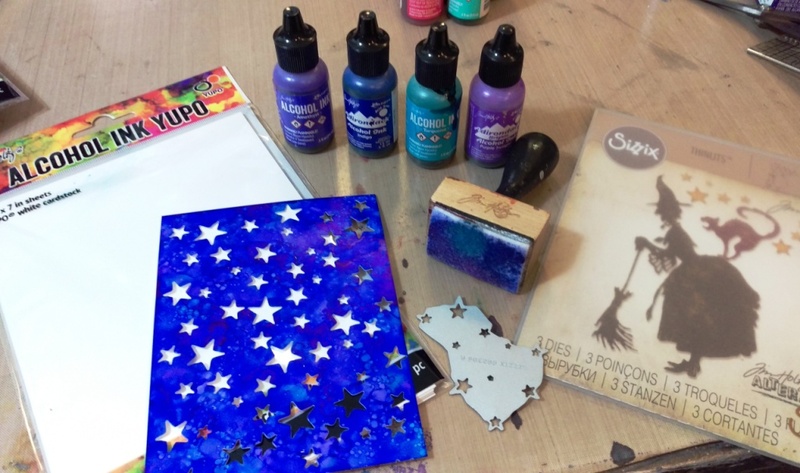 I pounced on a combination of blues and purples onto White Yupo Paper, and then die cut it with the starry Thinlets from Tim and Sizzix. 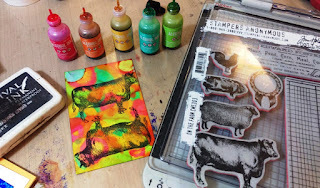 Straight from the bottle, I squeezed drops of pink, orange, yellow, green, and turquoise Alcohol Inks onto more White Yupo, for a tie dyed looked, and then stamped the cow image twice from Tim and Stamper's Anonymous On The Farm set, using Black Soot Archival. 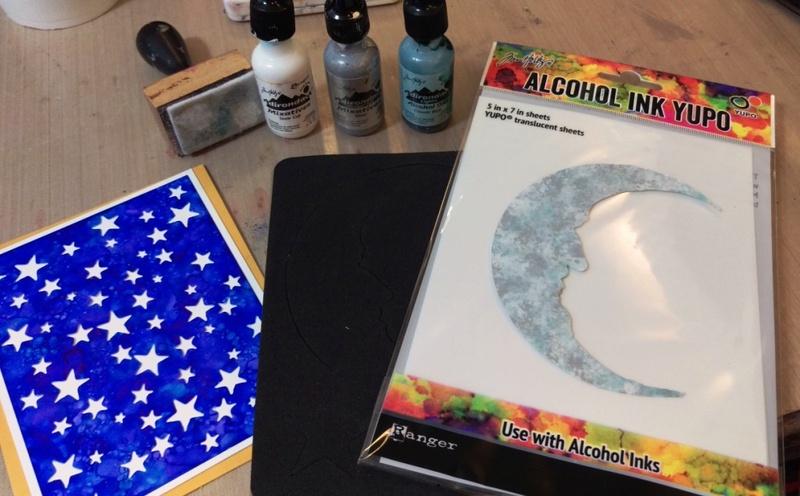 I die cut the moon shape from Translucent Yupo, and then pounced Snow Cap and Silver Mixative, along with Cloudy Blue Alcohol Ink onto the moon. I mounted the starry piece onto white and gold Distress Cardstock, and then adhered the moon. I misted the card lightly with Wendy Vecchi's Pearl Mica Spray from Ranger, for a more celestial feel. 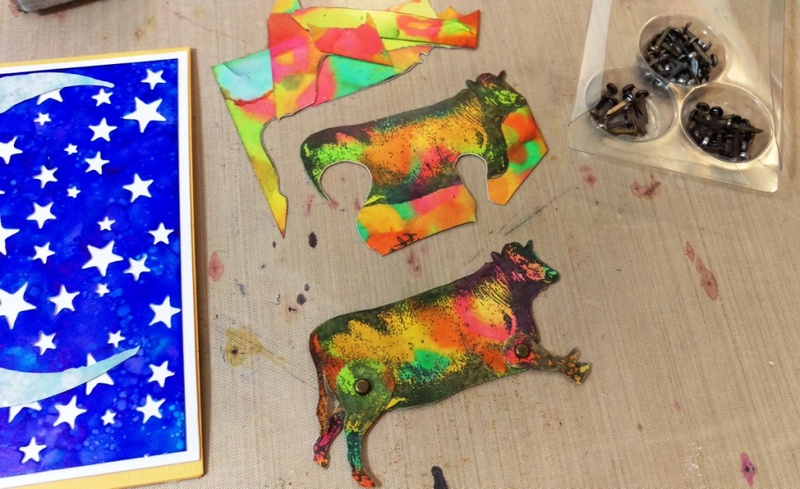 I cut out one complete cow, and then just the legs from the other cow. Then I used brads to join them to the legs of the other cow so I could position them so it would look like he is jumping. I finished with the sentiment mounted to left over tie dyed Yupo. 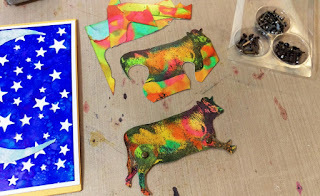 I'll be back again soon with another Alcohol Ink card. Until then, have an excellent week! How fun Anita! I love how you made the cow jumping, such a great idea! Especially love seeing seasonal dies used year round-thanks for the reminder on the starry die, I must break mine back out! 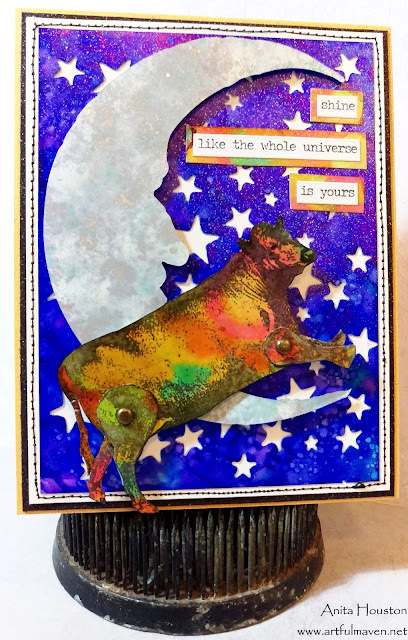 Thank you for sharing this wonderfully creative card! So cool! I look forward to seeing more of your creations. Another amazing creation. I have been Jones to do celestial skies for a while now. This is so much fun... I've just got that animal stamp set, but I'm guessing my cows won't be quite as psychedelic as yours! HIs jointed legs are a great touch and the starry sky is beautiful. This is so whimsical and FUN! I love the "jointed" legs on the cow...such a great addition. That moon is gorgeous! Looks like a slice of the real thing. And your starry background is genius. I really love the whimsical, playful feel of this card, Anita!